We’d love your help. Let us know what’s wrong with this preview of The Wasteland, Prufrock and Other Poems by T.S. Eliot. This volume brings together three of T. S. Eliot's powerful collections into one. It includes such classic poems as "The Love Song of J. Alfred Prufrock," "Portrait of a Lady," "Preludes," "Gerontion," "Sweeney Among the Nightingales," and "The Waste Land." To ask other readers questions about The Wasteland, Prufrock and Other Poems, please sign up. 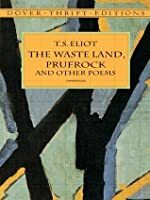 It seems to me that the author of 'Prufrock' and that of the Wasteland are so different as to be un-recognisable. A look at the Wasteland reveals a lot of, to me, gratuitous classical referencing for which we might like to blame Pound and while I value its novelty (whereas Prufrock reads like Kublai Khan) the Wasteland reads like deliberat If you're into stuff like this, you can read the full review. I measured out my life with coffee spoons in the hours, weeks, indeed months between when I first picked this up and when I subsequently set it down unfinished. It gets two stars in deference to the world of literary critics and english PhD's who call Eliot a master. I want to believe that good poetry has something to share with us. I even keep a copy of Garrison Keillor's anthology "Good Poem's For Hard Times" on my night stand, for Pete's sakes! It's there right now, see? (Ok maybe ther Uncle! I want to believe that good poetry has something to share with us. I even keep a copy of Garrison Keillor's anthology "Good Poem's For Hard Times" on my night stand, for Pete's sakes! It's there right now, see? (Ok maybe there the tv remote is sitting on top of it). But, some of those poems I understand - I think. Ole' T.S. is smarter than me and I think that's the problem here. I could get through a Lovesong for J. Alfred Prufrock well enough, but so much of The Wasteland is unintelligable to me that I found myself reading a page and setting this down. It's disgraceful - the thing can't be 75 pages and here I sit, unable to get through it. I think the last time I understood poetry was in fifth grade when I had to recite a passage from "The Midnight Ride of Paul Revere." Since then I've found that most poetry completely and utterly befuddles me. Well, I'm dumb. I admit it. I dont know how to review this because it always feels like I am still in the process of reading it and untangling it and pealing away it's layers. at times i find my self reciting the parts that i know of some of these poems. when I am really done with it. if I am ever, I might give a proper review. How many dozens of times I've been through this book I don't know. Read Eliot, that's all I can say. I didn't really take anything from this poetry. I like to believe poetry gives us something. Although I did look into the historical context and could see how it was compatible, it failed to make me feel any emotion or hold a connect. There some pretty language, but really, that was it for me. Not my kind of poetry? Mm. T.S. Eliot takes a lot of work. I wouldn't recommend just plowing through The Wasteland on your own. It's the type of poem you only really understand when you discuss it in a group. If I hadn't studied it in a class in college, I'm sure I never would've understood it. 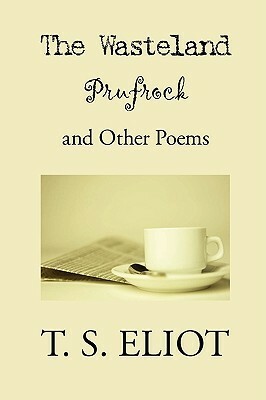 I would give 5 stars to Prufrock alone, and probably 3 or 4 to the rest. I especially loved Prufrock when I was single, b/c I think it captures the essence of male timidity. The language is oblique, but has some powerful contrasting T.S. Eliot takes a lot of work. I wouldn't recommend just plowing through The Wasteland on your own. It's the type of poem you only really understand when you discuss it in a group. If I hadn't studied it in a class in college, I'm sure I never would've understood it. I would give 5 stars to Prufrock alone, and probably 3 or 4 to the rest. I especially loved Prufrock when I was single, b/c I think it captures the essence of male timidity. The language is oblique, but has some powerful contrasting imagery. And it boasts probably the best opening lines of all time: "Let us go now you and I, and watch the evening spread against the sky, like a patient etherized upon a table." That's the gist of it anyway. Never a more jarring simile than this. Not only did I not get the "beauty" of most poems, or their "brilliance" for that matter, but the provided interpretations seemed rather bold. How does a person come up with such ideas? Why are they accepted? E.g. I interpreted Prufrock completely different and I admit it, I like my interpretation much better! I don't understand Eliot's poetry. But at least I tried. This review has been hidden because it contains spoilers. To view it, click here. T.S. Eliot’s poem The Waste Land is a collection of fragments. There are 5 parts to the poem and the connection between these parts are noted to be anything but obvious, yet they all hold different layers of voices and obscure elements to the non-traditional reader. The poem as a whole constantly shifts its point of view and is abundantly full of references of classic literature from varied cultures. The Waste Land is, in a more visual sense, bits of history—stories broken up by war and reassemb T.S. Eliot’s poem The Waste Land is a collection of fragments. There are 5 parts to the poem and the connection between these parts are noted to be anything but obvious, yet they all hold different layers of voices and obscure elements to the non-traditional reader. The poem as a whole constantly shifts its point of view and is abundantly full of references of classic literature from varied cultures. The Waste Land is, in a more visual sense, bits of history—stories broken up by war and reassembled into a new frame. I mention war, because Eliot witnessed the after effect combat plagues upon a nation from its casualties, for he finished The Waste Land after WWI in 1922. Eliot wrote about what he saw not what he felt. He wrote disassociated from himself and in the form of many other voices because he wanted to cultivate an inclusive human consciousness—an ordered and collective truth. Noted in The Observer, one of Britain’s top new leaders, The Waste Land has been said to be,”…one of the most important poems of the 20th century”. Arguably, this could be true to some, yet very false to others, namely those who have no knowledge of Eliot’s many allusions throughout the work. The poem is also noted to be difficult because of its ever changing scenes and at times various points of view and/or speakers. In one scene you’re a woman having a drink and discussing with your friend about getting dentures then, you are the bartender closing up shop and ushering patrons out. Yet, despite its difficulty to most, the poem has within itself a serious concern: the loss of our shared culture; predominately the classic and the public’s awareness of its life within our time. It’s ultimately important to read and care about this poem because, it is a work of art and a catalyst for one to not forget the past culture that is losing space, not only with time but, in the hearts and minds of us all. A great deal of symbolic ideas came from Jessie Weston’s book, From Ritual to Romance. Eliot himself is quoted saying, “Not only were the title but, the plan and a good deal of the incidental symbolism of the poem suggested by [Weston’s] book. From Ritual to Romance is a work that covers in depth the legend of the holy grail, also using terms such as ‘Fischer King’ and ‘ waste land’, which we can read and see in Eliot’s poem along with notes tarot cards. Eliot first introduces the cards in lines 46-54 with Madam Sosostris and ultimately follows through to the end in lines 427-430, foretelling the physical falling of the London Bridge but, also the fall of a great figure as well. In using such symbols and grand myths, like presented in From Ritual to Romance, it allowed Eliot to suggest that beneath ones everyday streets, like his own London town, there is an old story we all share even though it’s all in pieces below our feet. Eliot connects past stories and myths to suggest our history, as a whole, is intertwined with our present and future life. In the beginning of Eliot’s poem we are met with an epigraph. You may be asking yourself what is an epigraph? Simply, it’s like a quote or introduction for what your about to read. Furthermore, the epigraph Eliot chose is one of a Roman nature written around the 1st century A.D. This ancient manuscript, like The Waste Land was written in fragments, and was titled, “Satyricon” by Petronius. The story tells of an oracle, Sybil, who wished for immortality yet forgot to add the favor of youth in accordance to so many years. So, she forever was cursed rather than blessed to live out the rest of her days getting older and older. What Eliot’s quote describes in the beginning is a conversation with Sybil and a group of boys which ask her if she has anymore wishes, and she replies that she does and that is to die. This epigraph is significant because it’s a foreshadowing for what’s to come as well as an allusion to the spiritual and cultural death of the western world. This collection gathers the most popular of Eliot's poetry together in one slim volume and the reader, depending on the quality of their high English school teachers, is sure to remember many of them. Whether it's Journey of the Magi, The Hollow Men, The Waste Land, or the Love Song of J. Alfred Prufrock these poems demonstrate why T.S. Eliot was one of the most important poets of the modern period. Eliot as a writer established a unique voice arranging the words in every poem in such a way that This collection gathers the most popular of Eliot's poetry together in one slim volume and the reader, depending on the quality of their high English school teachers, is sure to remember many of them. Whether it's Journey of the Magi, The Hollow Men, The Waste Land, or the Love Song of J. Alfred Prufrock these poems demonstrate why T.S. Eliot was one of the most important poets of the modern period. Eliot as a writer established a unique voice arranging the words in every poem in such a way that it spoke directly to the alienation of the reader and let them see inside of their own hearts. For my own reading The Love Song of J. Alfred Prufrock remains the most powerful poem in the collection for the way it manages to express the pain of wanting to speak, but withholding for fear of being thought a fool. Even if the reader is no fan of poetry this collection should still be considered because Eliot has, despite the time that has passed, managed to remain a writer worth reading and worth remembering. Need to read it 5 more times to understand. Classic ! Loved re reading it after ages and still finding layers of meaning hidden in the poem . It’s dystopian in feel ,part philosophical and replete with biblical allusions. there is a very small quantity of poetry volumes, and books in general that could compare to the quality of this book. it has achieved such a collection of achievements that are so very difficult, and as a collaboration has never been seen. first: any holder of a respectable degree in English literature, or student, or even your average avid reader would tell you; the waste land is mother of all avant gard. and that alone is a tremendous achievement, but to achieve it while still holding the love a there is a very small quantity of poetry volumes, and books in general that could compare to the quality of this book. and that alone is a tremendous achievement, but to achieve it while still holding the love and respect of the masses and critics alike, makes t.s.Eliot, the greatest poet of all times. I do not exaggerate in this review, on the contrary, the poems of Mr. Eliot hold such great depth and strong emotions , that are put in the most interestingly aesthetically vulgar of ways that uncontrollably and involuntarily hold your attentions. Eliot is one of my favorite poets to read. He utterly confuses me at times, but his poetry always has me looking for the deeper meaning in things. It stretches my brain almost to the point of pain at times to read Eliot (cough...the Wasteland), but I enjoy this kind of pain. I listened to this as an audiobook. Hearing Jeremy Irons reading Eliot is one of the most relaxing activities imaginable. These poems read in his voice are perfect for a rainy day. The melancholy Prufrock, painful Wasteland and Quartets finished by the whimsical Old Possum’s Cats combine to display the incredible range of T S Eliot’s mastery of mood and language. Thoroughly enjoyable. T.S. Eliot is my all-time favorite poet - I'm not sure if I've read this addition of his poems, but I've read enough to give his poetry 5 starts. The Wasteland and The Love Song of J Alfred Prufrock are the best, and everyone should read them. His use of language, ryme, and flow are incredible. I'm still working on my comprehension of poetry. But I must say that this was pretty good, or at least, I took some from it. mirando el alma de la luz, el silencio." Totèmica edició de Lumen, que recull "La tierra baldía" i "Prufrock y otras observaciones", en tapa dura, poemes comentats i revisats de dalt a baix, t'adones de la quanitat de fragments i referències que hi ha cada 2 versos. I la veritat que sembla un "àlbum" de música fet a base de "samples" modificades. Sent sincer, he entès el 30% dels poemes, i de "Tierra baldía" sovint no entrava en el que estava dient, sense comprendre les referències religioses, barreja lingüística acollonant francés, it Totèmica edició de Lumen, que recull "La tierra baldía" i "Prufrock y otras observaciones", en tapa dura, poemes comentats i revisats de dalt a baix, t'adones de la quanitat de fragments i referències que hi ha cada 2 versos. I la veritat que sembla un "àlbum" de música fet a base de "samples" modificades. Sent sincer, he entès el 30% dels poemes, i de "Tierra baldía" sovint no entrava en el que estava dient, sense comprendre les referències religioses, barreja lingüística acollonant francés, italià, sànscrit, grec... Sort que Lumen s'esforça a mostrar-te les múltiples referències, sinó un aniria absolutament perdut. Hi ha parts brillants, que tremoles llegint, d'una puresa bestial, però clar, les que no he arribat a entendre se'm fan difícils de valorar. El paper d'aquest poeta en la poesia contamporània és clau, una ment capaç de tot. El pròleg és francament interessant, hi ha reflexions de Eliot respecte problemes estètics i comentaris sobre la tradició, a càrrec d'Andreu Jaume. La tradición reviste una significación mucho más amplia. No puede heredarse: si se desea, exige gran esfuerzo. Exige ante todo sentido histórico, algo que podemos considerar casi indispensable para cualquiera que desee seguir siendo poeta después de los veinticinco años; y el sentido histórico implica que se percibe el pasado, no sólo como algo pasado, sino como presente; y el sentido histórico obliga a un hombre a escribir no sólo integrando a su propia generación en los propios huesos, sino con el sentimiento de que toda la literatura de Europa, desde Homero y dentro de ella, el conjunto de la literatura de su propio país, posee una existencia simultánea y constituye un orden simultáneo. Ah, no preguntes: «¿De qué se trata?». más allá de la música que llega de un salón a lo lejos. ¿Así que cómo puedo yo suponer? a escupir todas las colillas de mis días con sus pasos? ¿Y cómo puedo yo suponer? he vuelto para deciros a todos, os voy a decir a todos…». casi, a ratos, el bufón. Llevaré doblados los bajos del pantalón. ¿Tendría que peinarme hacia atrás? ¿Debería comerme un melocotón? Llevaré pantalones de franela blanca y caminaré por la playa. He oído a las sirenas cantándose, cara a cara. No creo que canten para mí. cuando el viento sopla el agua negra y blanca. hasta que voces humanas nos despiertan y nos hundimos en el agua. "Retrato de una dama II"
de que a través del abismo tiende usted la mano. Cuando ella reía me veía de pronto envuelto en su risa y formaba parte de ella, hasta que sus dientes no eran más que fortuitas estrellas con talento para la instrucción de ejércitos. Fui arrastrado por breves jadeos, inhalados en cada recuperación instantánea, perdido finalmente en las oscuras cavernas de su garganta, golpeado por las ondas de invisibles músculos. Un camarero mayor con manos temblorosas estaba poniendo deprisa un mantel a cuadros blancos y rosas sobre una oxidada mesa de hierro verde, diciendo: «Si la señora y el caballero desean tomar el té en el jardín, si la señora y el caballero desean tomar el té en el jardín…». Decidí que si la agitación de sus pechos podía pararse, se podrían recoger algunos de los añicos de la tarde, y con cuidadosa sutileza puse toda mi atención a tal fin. A "La figlia che piange" és molt curiós el joc entre les persones verbals, el narrador i el gènere. como de tu sombra por la tarde alargándose hacia ti. está tu carta, el marinero fenicio ahogado. la señora de las situaciones. el ahorcado. Temed la muerte por agua. hay que ser tan prudente hoy en día. nunca hubiera dicho que la muerte hubiera deshecho a tantos. y cada hombre fijaba los ojos ante los pies. con un sonido muerto en el repique final de las nueve. Ahí vi a uno que conocía y le paré gritando: «¡Stetson! 70 ¡Eh, estábamos juntos en los barcos de Mylae! ¿ha empezado a brotar? ¿Florecerá este año? ¿O la repentina helada le ha malogrado el lecho? o lo desenterrará de nuevo con las pezuñas! ¡Tú, hypocrite lecteur, mon semblable, mon frère!». y los beneficios y las pérdidas. 10. Tell short tales within the poem that have no connection to the others. Eliot is said to have ushered in the modernist movement in poetry. That is to say he largely did away with rhyming and sentimentality employed by the Victorians. He painted a dying world in the relatively few poems he gave us. "The Waste Land" is considered his best--perhaps because it is his longest. "The Hollow Men," however, shines brightest with its Shakespearean and Heart of Darkness references. A number of songs have been written about Eliot's poems and the famous play Cats was based on his Old Possum's Book of Practical Cats. Meh is how I would sum up the body of poetry Eliot left us. It certainly pails in scope and impact to the poems of Edgar Allan Poe. Edgar Allan Poe's Annotated Poems One has to wonder if he would be known at all without the litter of jellicle cat poems he penned, had more than nine lives on the West End and Broadway. Este pequeño libro, nada más que una muestra representativa de lo mejor de sus primeros poemas, aquellos que (según decir de la editora) revolucionaron la lírica inglesa, es un auténtico portento, versos que me calaron hondo y en ellos me extravié durante horas, y si bien es innegable que, hoy día, acostumbradísimos a ver retratada de tal “real” forma la vida cotidiana, el impacto no podría ser el mismo que seguro sintieron los primeros lectores de Eliot, el retrato que éste hace del transcurrir de nuestras horas sigue siendo no obstante asombroso. Y no sé, todavía no sé, pero pronto lo averiguaré, supongo, qué tanto la visión y arte de Eliot cambiaron con el paso de los años, asunto mencionado en la introducción al libro, pero aquí, al menos, esa modernidad tiene aún visos de esperanza, puede percibirse una pequeña luz al final del largo túnel, pues no sólo trabajamos, comemos, nos bañamos, compramos en centros comerciales y viajamos en gusanos metálicos bajo tierra: también soñamos, anhelamos, deseamos y, en el aislamiento y fragmentación del espacio citadino, nuestras vidas siguen conectadas al gran todo del mundo. Y es que, en líneas muy generales, de eso es de lo que nos hablan The Waste Land, Sweeney, “The Hollow Men”, o “La figlia che piange”, una inmensidad de la que todos somos parte, y que aún apunta hacia adelante, presagiando o entreviendo o anhelando un descubrimiento. Revelación que sin embargo no se produce, y que, con el horror de la Gran Guerra, da paso a las dudas, a un atolondramiento, cuestionamiento y desánimo, perfectamente reflejados en Ash Wednesday y “The Journey of the Magi”, en que la voz del poeta respira su pesar y desconsuelo, ya mitad arrepentido de haber abandonado sus referentes, extraviado, aislado y fragmentado sin contrapeso alguno. "Let us go then, you and I, when the evening is spread out against the sky like a patient etherized upon a table..."
This collection contains two of Eliot's most famous works, The Love Song of J. Alfred Prufrock and The Waste Land, but it also includes all the other poems he published betwen 1917 and 1922. I love Eliot and his use of allusion and symbolism in poetry. Because this volume is annotated there was a constant string of footnotes translating text and explaining references in the poems, "Let us go then, you and I, when the evening is spread out against the sky like a patient etherized upon a table..."
This collection contains two of Eliot's most famous works, The Love Song of J. Alfred Prufrock and The Waste Land, but it also includes all the other poems he published betwen 1917 and 1922. I love Eliot and his use of allusion and symbolism in poetry. Because this volume is annotated there was a constant string of footnotes translating text and explaining references in the poems, which I often found more distracting than helpful, but which certainly does come in handy when you're trying to make sense of poetry such as this. But really, do we have to make sense of it? Can't we just read it and let it sift through our own experiences, connect with our own history? I so enjoy reading phrases like "The worlds revolve like ancient women/gathering fuel in vacant lots" or "In this decayed hole among the mountains/in the faint moonlight, the grass is singing/over the tumbled graves, about the chapel/There is the empty chapel, only the wind's home./It has no windows, and the door swings,/Dry bones can harm no one." Good, yes, but incredibly inaccessible for anyone without an English degree. This is probably best read as part of a course so there is someone to guide you through the language and all the literary references, and it would help if you have a good command of French (and it would be even better if you also understood at least some Greek and Latin). This isn't to say that all of the poems in this collection are as inaccessible as "The Wasteland" and some of the others. Once you've translated the Fr Good, yes, but incredibly inaccessible for anyone without an English degree. This is probably best read as part of a course so there is someone to guide you through the language and all the literary references, and it would help if you have a good command of French (and it would be even better if you also understood at least some Greek and Latin). This isn't to say that all of the poems in this collection are as inaccessible as "The Wasteland" and some of the others. Once you've translated the French poems (or, if you're lazy, looked up a translation online), they are surprisingly accessible, and almost elegant in their simplicity. "The Love Song of J. Alfred Prufrock" is, in my opinion, the best in the book since it is both accessible and full of the beautiful language Eliot is known for. Re-read this again because I am reading "Constellation of Genuis" and that centers around Joyce and Eliot. Prufrock is one of my favorites but I didn't remember Wasteland or his other poems very clearly. Great stuff. My favorite is still Prufrock. Thomas Stearns Eliot was a poet, dramatist and literary critic. He received the Nobel Prize in Literature in 1948 "for his outstanding, pioneer contribution to present-day poetry." He wrote the poems The Love Song of J. Alfred Prufrock, The Waste Land, The Hollow Men, Ash Wednesday, and Four Quartets; the plays Murder in the Cathedral and The Cocktail Party; and the essay Tradition and the Individ Thomas Stearns Eliot was a poet, dramatist and literary critic. He received the Nobel Prize in Literature in 1948 "for his outstanding, pioneer contribution to present-day poetry." He wrote the poems The Love Song of J. Alfred Prufrock, The Waste Land, The Hollow Men, Ash Wednesday, and Four Quartets; the plays Murder in the Cathedral and The Cocktail Party; and the essay Tradition and the Individual Talent. Eliot was born an American, moved to the United Kingdom in 1914 (at the age of 25), and became a British subject in 1927 at the age of 39.